Joan Tubau, general director of Médecins Sans Frontières in Spain, has just returned from visiting Médecins Sans Frontières' projects in northern Nigeria. He describes the consequences of the conflict on people in the area. Since 2009, northern Nigeria's Borno state has been the epicentre of a conflict that currently confronts Boko Haram and the armies of the Lake Chad region – Nigeria, Cameroon, Chad and Niger. More than two million people have been displaced from their homes as they flee attacks, fighting and military operations. Most are in Borno state. The population of the state capital, Maiduguri, has almost doubled with new arrivals. Some live in camps, others are scattered across the region. Some people have been displaced several times over. A large part of Borno’s population lives in small towns taken over by the army. The security situation is very volatile in the areas surrounding these enclaves, and people’s movements are severely restricted. Often they are confined to an area of just a few square kilometres. They cannot cultivate their land and even collecting firewood is difficult. According to our teams, this is the situation in towns such as Pulka and Gwoza, near the border with Cameroon. Changes to their way of life and the loss of their livelihoods is having a major impact on people’s health and nutritional status. In recent months, we have seen high peaks of illness and high mortality rates. In addition, Borno is an area where malaria is endemic and diarrhoea and respiratory infections pose a constant risk, especially for children under five. Many people’s basic needs, including for food and water, are not being met. On top of this, most people are living in constant fear of renewed violence, and many have experienced the loss of close relatives. 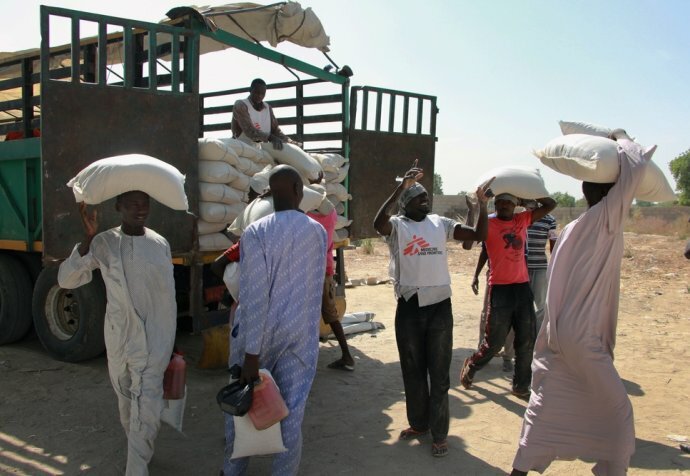 In response to the scale of people's medical needs, Médecins Sans Frontières is working in 11 towns in Borno state –with permanent teams in some towns and regular visits to others. We run hospitals and clinics where we treat severe cases of malaria, respiratory infections and malnutrition, and perform surgeries and caesareans. We also provide psychosocial support and, in many cases, water and food, which can make the difference between life and death for people in this situation. In the first five months of 2017, Médecins Sans Frontières teams provided more than 140,000 medical consultations and treated some 12,000 children for malnutrition. Some parts of Borno state are still inaccessible to aid organisations. As a result, the people there receive no aid at all. In many places where we work in Borno state, we are one of very few organisations on the ground and our teams have to provide a considerable part of the services. More humanitarian organisations are needed on the ground. People’s needs are huge, and that is likely to continue. As the conflict evolves, more and more people are being forced to leave their homes.